Church of Our Lady before Týn, Prague. The main church on the old town square. 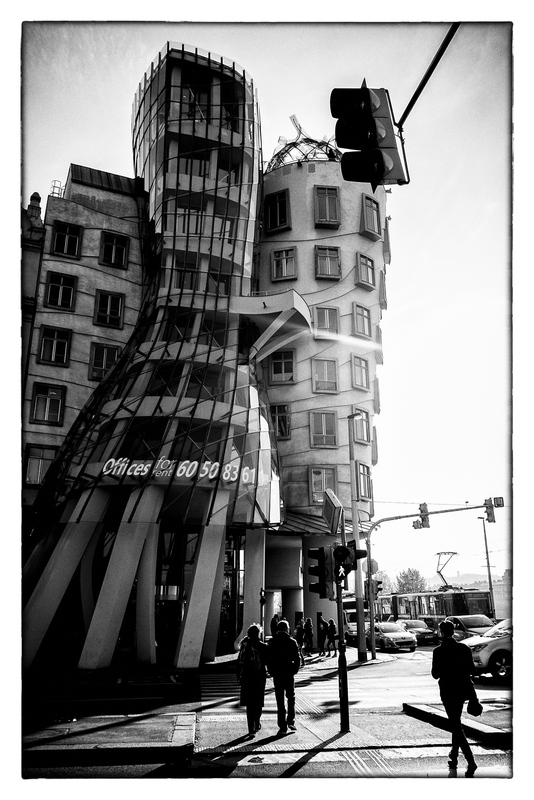 The Dancing House – aka Fred and Ginger – in Prague was designed by the Croatian-Czech architect Vlado Milunić in cooperation with Canadian-American architect Frank Gehry. 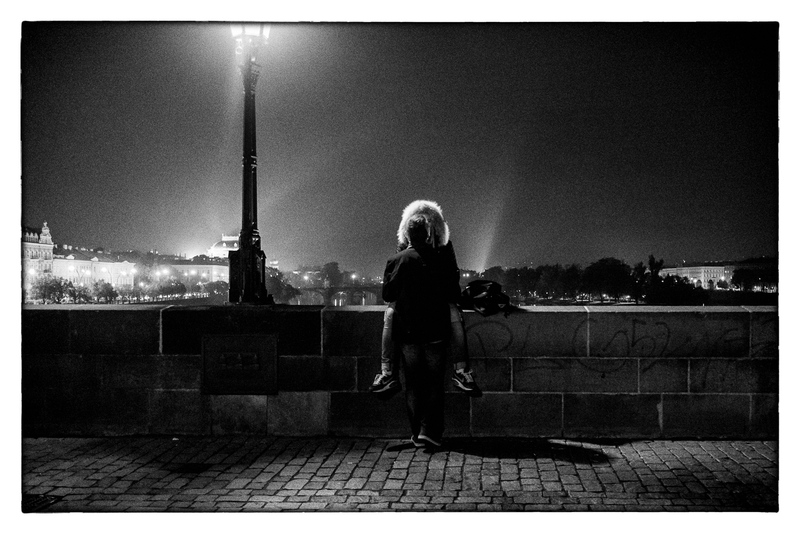 Night on Charles Bridge, Prague. The statues are beautifully lighted at night, creating interesting motives. Charles Bridge, Prague. The old bridge is bustling with life, also in the evening. Castle Area, Prague. 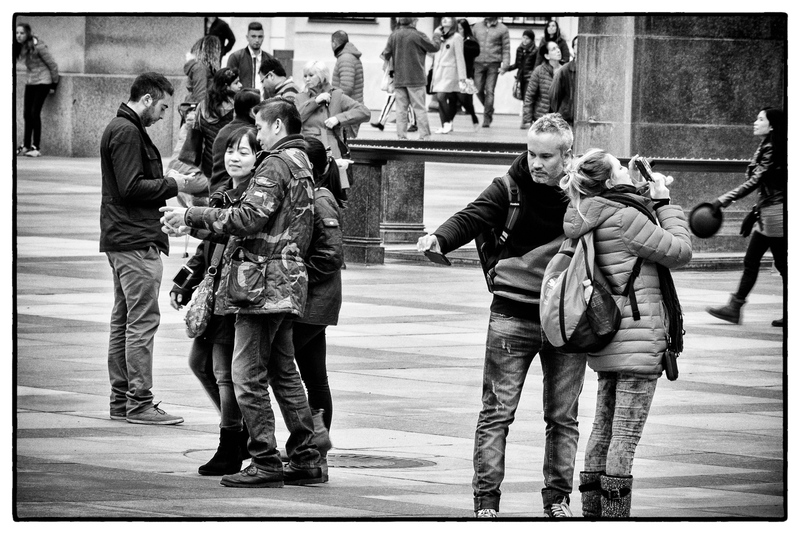 Modern sightseeing. There’s often movies being shot in Prague. This means you can chance upon light like this. Google made the Nik Collection of photo processing plugins available for free yesterday. When Google bought software developers Nik because they wanted their Snapseed mobile photo processing app a couple of years ago, some were enthused because the full set of Nik Collection plugins for Photoshop, Lightroom and Aperture saw a price drop from about 500 USD to 150 USD. But now it’s all free. I guess this means there’ll be no more development on the plugins, but at least what is available is good. I’ve noticed the Nik module Silver Efex Pro has been a favourite with many photographers into black and white processing, so I’ve given it a try. 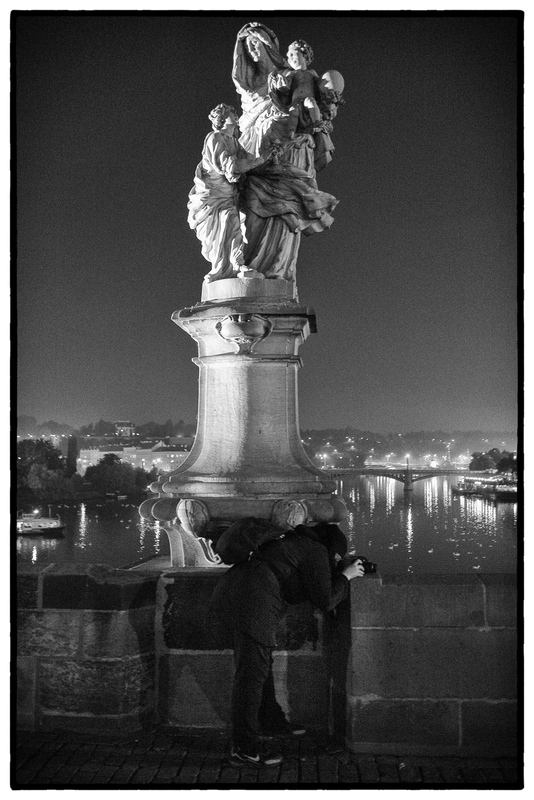 The photos were taken with a Fujifilm X-E2 camera with assorted lenses (mostly the Fujinon XF18mm f/2, and one each with the XF14mm f/2.8 and one with the XC50-230mm telezoom) during a weekend visit to the wonderful city of Prague, capital of the Czech Republic, in October 2015. The Nik Collection basically has several modules for mimicking analogue films and darkroom processing of film photography. The Silver Efex Pro module is focused solely on black and white processing. In addtion to presets that are digital attempts at mimicking favourite black and white films like the Kodak Tri-X 400 and the Ilford HP5, you get various tools for finetuning the appearance of the image being processed which go beyond what is easily achieved in other photo processing software. To get going, you need to download the toolset, and install it on your computer. You need Adobe Lightroom or Photoshop – or the discontinuted Aperture program from Apple – to use it. Once installed, I suggest you watch these introductory videos, and you’re good to go exploring the toolset. For this attempt at using the software, I first adjusted the Fujifilm raw files in Adobe Lightroom, then opened them with Silver Efex Pro for fine tuning. I didn’t do any black and white adjustments in Lightroom, but of course that is possible, too. To use the module from Lightroom, you either right-click the image(s) or choose the Photo menu, then select Edit In – and then the Nik Collection module you want to use. My first impression of Silver Efex Pro is good. I feel I’m easily able to control how I want my black and white photos to look. The dedicated sliders for tuning Brightness, Contrast and Structure, with subdivisions for Hightlights, Midtones and Shadow for each of them, are very powerful. So far I am especially impressed with the Structure slider, which lets you bring in details in the image in an impressive way. For many of these images, I also used a film simulation – most often the Kodak Tri-X and the Ilford HP5. I’ll possibly go easier on the image borders next time, but for now they seemed fitting. All files were Fujifilm raw files first developed in Adobe Lightroom, then finetuned in Silver Efex Pro. Fantastic, Trond. These are all wonderful – and interesting. I’m not sure I would tackle it, but glad to see that you did! Thanks June! Do let me know if you give it a go and share the results!